Vice President M. Venkaiah Naidu has said that skill development should be a continuous process and the innovations must help making the lives of people better. He said this while addressing the gathering at the Valedictory of the Diamond Jubilee Celebrations of Educational Institutions run by Nachimuthu Industrial Association (NIA), in Pollachi, Tamil Nadu on Wednesday. The Vice President also expressed concern over the rising urban rural divide and stressed the need to create urban amenities such as educational institutions, uninterrupted electricity, access to drinking water and medical facilities at affordable cost for the benefit of people. He argued in favour of a bias towards rural areas in allocating funds, creating infrastructure at par with urban areas. Addressing a young gathering of school children, the Vice President highlighted the need to acquire skills to grab the opportunities in the technology driven job market. Develop the habit of upgrading your skill set in line with the changing technology, he said. Skill development forms a fitting bulwark against the increasing vagaries of the global business environment and honing and polishing skills should be a continuous practice, he added. 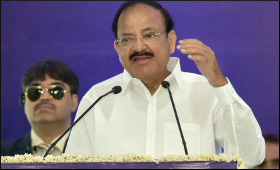 Quoting report by a leading employment solutions company that claimed that more than 90% of the engineering graduates of India were unemployable, Naidu cautioned the young students understand the seriousness of the situation. He has asked teachers & educational institutions to take a good hard look at the curricula and the teaching method so that the gap between a classroom and the workplace can be bridged. The Vice President said that government of India is extremely sensitive to the dreams and aspirations of young India and is doing everything possible in its power to support, nurture and empower the youth of the country. It is up to young people to make use of this opportunity, he added. Tasking the universities, colleges and premier institutions to focus on innovation, the Vice President said that innovations must help making the lives of people better. Innovations should keep in mind the status of our environment as well. He highlighted the need to use Science & Technology to protect the nature and take steps to restore the lost balance in nature.